I like using an advent calendar at Christmas to count down the days to Dec 25th. However, we always make sure that our advent calendars have a purpose. Here are three ideas you could consider using this advent to prepare your children (and family) for the celebration of Jesus’ birth. All of these will enable you to teach Christian theology to your kids over Christmas. Jesus fulfilled over 300 prophecies through his birth, life and death. Jesus – and later his disciples – often used the proof of fulfilled prophecy to prove that Jesus was the Messiah. This is an advent activity designed to introduce children to Old Testament prophecies that were fulfilled through Jesus’ birth. Each day, you will learn a new Old Testament prophecy that Jesus fulfilled. Plus, you will learn just how difficult it is to fulfil prophecy on your own. This calendar is simple to make and do. 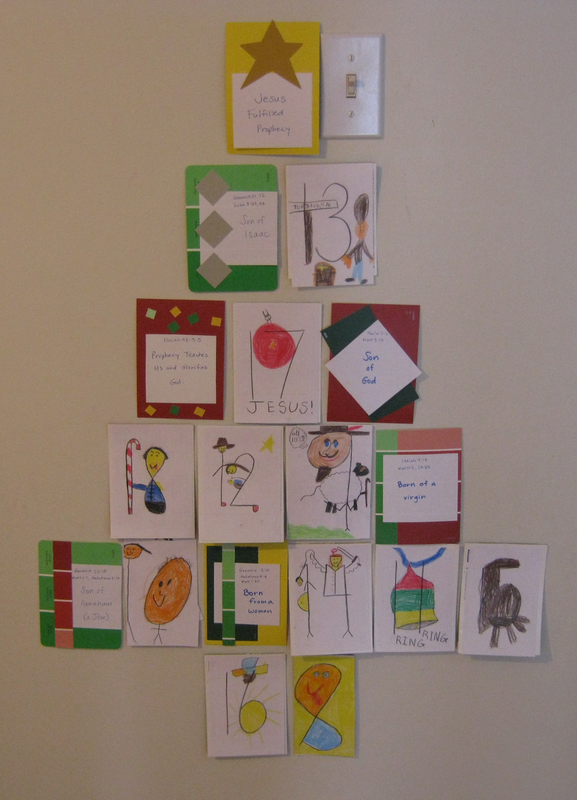 I had our kids help to make the cards as you can see illustrated above. The specific instructions are here. By Christmas day your children will know that Jesus’ birth was no mere accident or simple undertaking. It involved God in every step. God uses numerous different names to describe Himself throughout the Bible. 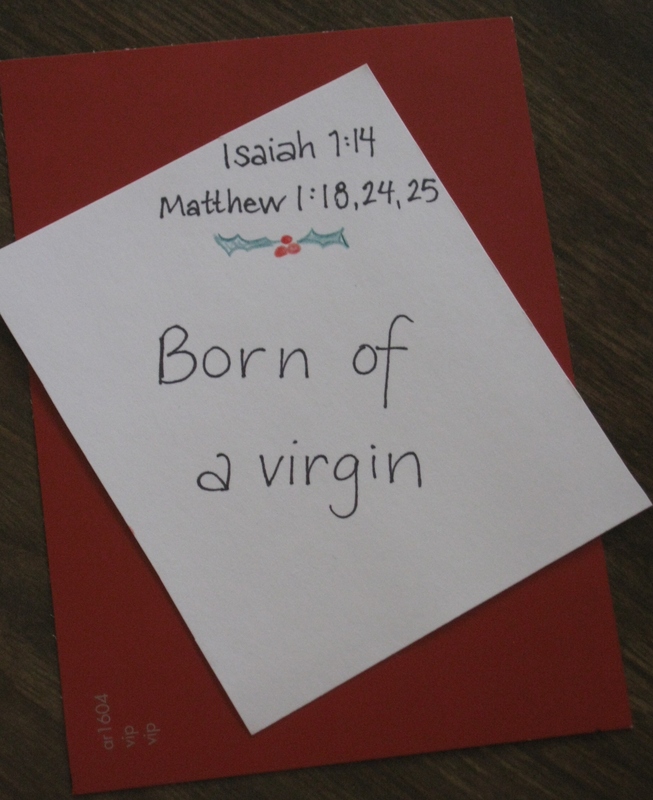 It is sometimes easy to forget that the seemingly helpless babe in the manger is also the Almighty God of the Bible. As you anticipate Christ’s birth – ‘God with us’ – learn some of the names God uses to describe who He is. 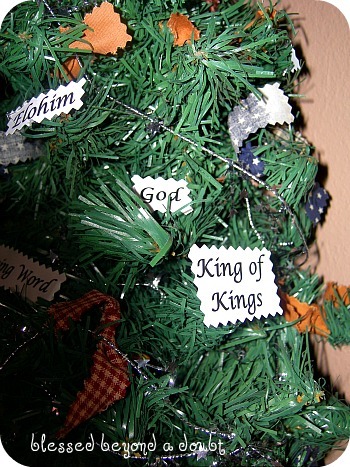 You could write out these names on fancy paper and affix them to your tree (or a separate tree as illustrated in the picture to the right and described in this post). You could alternatively hang them from your mantle with ribbon. Patterns and suggestions for making the Jesse Tree ornaments are here. You can add your decorations to your Christmas tree, or make or buy a separate tree like the beautiful version illustrated above that comes from this blog site. The instructions for the readings are here. Instead of using their Talk About suggestions, we talked about the link between the story and Jesus (ie: God’s salvation plan). However, this link is not necessarily explicit in the text provided. Do you have any other ideas to share with us? I’d love to hear about them!